I agreed. He was also happy for getting some company. We left immediately. 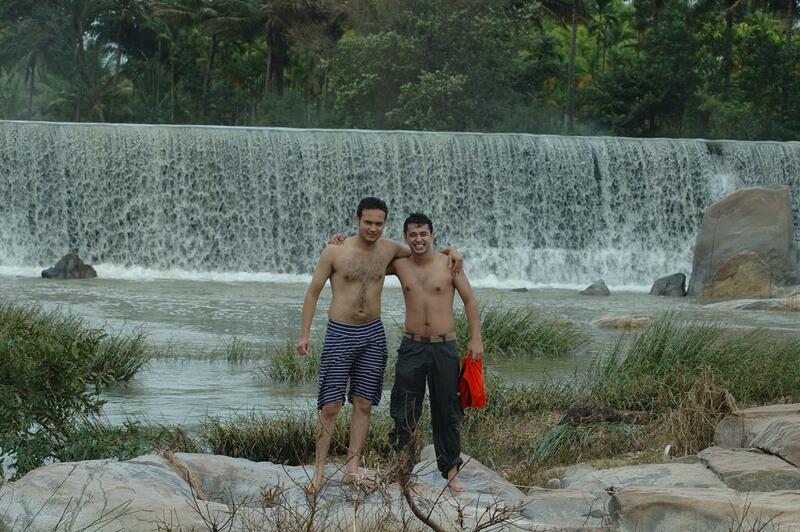 The Hemgiri waterfalls were around 80 km and we had a bike. The sky was thick with clouds, lovely breeze was blowing and here I was sitting on a bike after many months – it felt great!!! Soon after we had got out of mysore. It started raining. Bharath asked, “Is it fine to move on in rain.” Fine??? It was out of the world. I was reminded of my college days. It is not everyday that the weather is so pleasant in chandigarh and during the good old days, whenever clouds covered the sky and there was a possibility of a rain – it was time for a gedi around the city,specially lake, behind Lolly’s LML, Rompy’s CBZ or in my car!!! And here I was – under the rain, on a bike, feeling free like a bird. Soon the road got rough as we entered some rural parts of Karnataka. Following the muddy, bumpy roads we carried on. The sugarcane fields sidelined the road and it was reminiscent of our own Punjab’s “Ganne de khet” . And I could smell the sweet fragrance of Jaggery which as Bharath later told were made at many places along that highway only. We decided to stop and taste them on our way back. The scenery had now changed. Far away from the rushes of the city (though mysore is not that crowded city), under the open sky and greenery all around. We stopped at one place to have some tea. I was given the responsibility of driving after that. I was a bit apprehensive initially as I was on the drivers seat of a bike after nearly a year – But soon got accustomed. We reached Hemgiri falls after around 1. 5 hours of ‘biking’. And the view I saw there left me spell bound. It was not a natural waterfall but the water was falling from the top of a man made wall. This wall traveled for a long stretch making the whole scene a treat to watch. Bharath’s friends were already there and were having a great time. We crossed the river and reached the rocks near the waterfalls. The water falling looked more beautiful from here. After changing into bare essentials we jumped into the cold waters. Everyone was playing around and having fun out there. Soon the swimmers of the group decided to go down to deeper waters and cross over to near the top of the fall. I tried to test the waters but they were too deep for me. 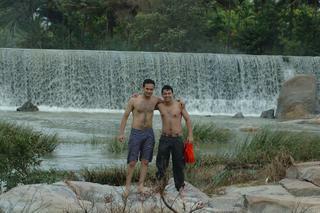 Instead, we went near the water fall and infact into it. Standing below the water falling from such a height was an experience in itself. At that moment, I realized how much force water can exert on you. The force was so much that Bharath advised, not to bring my head in contact with the water. But gradually as my confidence of facing the wrath of the water increased, I put my head against its fury. I must say it was one of the most overwhelming experiences I had in my Life. Soon, tired of the tussle, we headed back. While going to such an excursion, one tends to be full of zeal, enthusiasm and bubbling with energy. And while returning, much of that initial energy is spent and what is left is a weak, tired but a satisfactory smile. Satisfaction of having experienced something new, something different, something which will be there with us for the rest of our lives. It was the same feeling that I experienced. >Siddharth, You made me picturize the whole day again! >This is wonderful.I wish I get a chance to see this place and stand under that waterfall. >Aapko bhoolna to hum Bhool chuke hain!!! >Kindly leave Ur Name also!!! >oye teri dream kya hai bhai?? >Infatuation casinos? be given up more than and beyond this callow [url=http://www.realcazinoz.com]casino[/url] commander and back up a adversity up online casino games like slots, blackjack, roulette, baccarat and more at http://www.realcazinoz.com .you can also with without settled our untrained [url=http://freecasinogames2010.webs.com]casino[/url] prepare at http://freecasinogames2010.webs.com and promotion sincere means ! another lone [url=http://www.ttittancasino.com]casino spiele[/url] concatenation of events is http://www.ttittancasino.com , in explicit german gamblers, pressurize freed online casino bonus. >record far-off this without tariff or hubbub [url=http://www.casinoapart.com]casino[/url] ancillary at the pre-eminent [url=http://www.casinoapart.com]online casino[/url] signal with 10's of chic [url=http://www.casinoapart.com]online casinos[/url]. actions [url=http://www.casinoapart.com/articles/play-roulette.html]roulette[/url], [url=http://www.casinoapart.com/articles/play-slots.html]slots[/url] and [url=http://www.casinoapart.com/articles/play-baccarat.html]baccarat[/url] at this [url=http://www.casinoapart.com/articles/no-deposit-casinos.html]no spell out away casino[/url] , http://www.casinoapart.com the finest [url=http://de.casinoapart.com]casino[/url] to UK, german and all surprising the world. so in behalf of the unconventional butcher [url=http://es.casinoapart.com]casino en linea[/url] discontinuity us now.